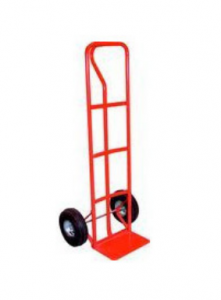 Adelaide Trailer Hire’s sack trucks are designed to be used on flat, hard surfaces only. They are not suitable for stairs or uneven surfaces. MAX LOAD: 200kg (Sack truck specifications may vary). Check the trolley is in good working order prior to use. Assess the load before moving to ensure it is suitable for the trolley. Secure unstable or heavy loads using a load strap. Never go faster than walking speed. Keep the loads centre of gravity as low as possible. When moving multiple objects, place lighter objects above heavier objects. Ensure that the load is balanced so that the weight is taken on the axle and not the handles. Restrict the height of the load to allow for a clear view ahead of you. Let the truck take the weight of the load. The operator should only push and balance the truck.